Public restrooms are not known for being clean places. Bellevue College’s bathrooms are no exception in this regard. The toilets are everything from new and shiny to slightly dingy to outright disgusting at times. For a room with rest in the name, it is hard to find peace in most BC restrooms. In the worst bathrooms, the “experience” starts as soon as the door opens. Sooner, if the ADA button to open the door doesn’t work. Upon entering the bathroom, the ambience is set by dirty floor tiles and yellow lighting which subtly reminds users of the business therein. After the lights set the mood, the smell often adds to the atmosphere. A foul mixture of old, stagnant urine and unflushed water reaches from the urinals and toilets to assault nostrils. If one can make it past the vanguard of sights and smells, the toilets themselves offer no relief. Sometimes, the bathrooms don’t receive the respect they deserve. One male BC student said, “Some people don’t flush after themselves, and that’s really disgusting.” Another student chimed in with, “There is pee on the floor, especially around the base of the urinal and toilet, and that’s pretty nasty.” These two men were talking specifically about the first floor men’s room in the Student Union, which probably take the title for worst bathroom on campus. The combination of high traffic and limited time between classes means that it is often at capacity several times throughout the day. The students who use it simply do not bother themselves with common bathroom etiquette, such as properly flushing and ensuring that trash gets to the cans instead of the floor. Tali Yehuda is the campus operations manager in charge of the custodial staff on campus. Her team knows of the bathroom situation. They bring her pictures of bathrooms with paper towels strewn across the floor, the remnants of showers in the sinks, and feces in places other than inside the toilet. The custodians work hard, but, “The custodians are stretched thin. The custodian that does C building does another 4 buildings,” Yehuda said. Each custodian makes sure to clean each bathroom under their jurisdiction, twice a day at minimum. However, any time that something needs to be cleaned up outside of normal operations, such as a broken glass, spilled food, or clogged toilet, it takes the custodian away from their assigned cleaning route. This leads to bathroom cleanings getting behind schedule, and all it takes is one 10-minute break between classes for people to demolish a bathroom. The janitors are constantly looking into new cleanliness solutions though. Larger trash cans will be put in bathrooms that struggle with paper towels on the floor. They have looked into increasing water pressure to ensure that toilets flush properly. Yehuda has even gone so far as to contact distributors to attempt to find new toilet paper that flushes easier. 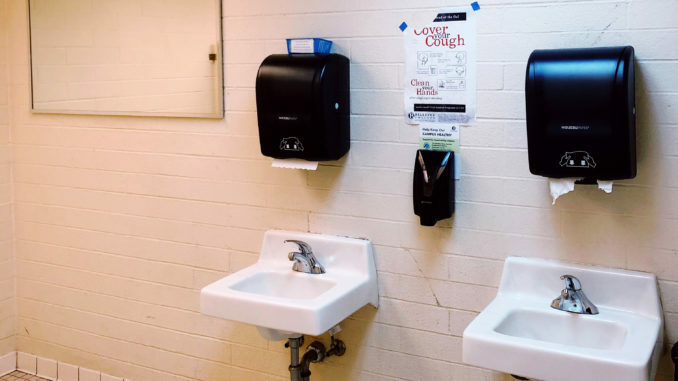 “We use what we have and the resources that we have and try to make it the best that we can.” The janitorial staff have also made their dispatch number available on every bathroom, so a clean bathroom is only a phone call away in most cases. The bathrooms are gross because the students make them gross. Failing to properly use and flush the toilet is just a part of how the bathrooms are mistreated. Although the janitors work valiantly to ensure a clean place to relieve, the callous actions of disrespectful students undo all their work, and leave the restrooms in shambles. Students need to take some pride in themselves and stop leaving such disgusting messes behind.